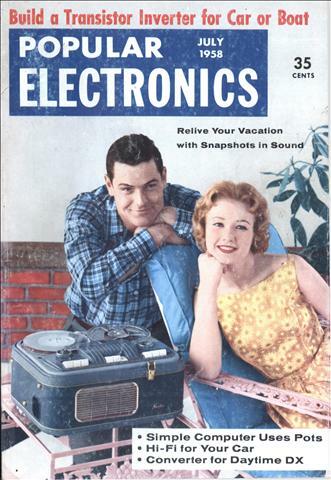 Relive your summer vacation with a record on tape YOU'RE ALL PACKED and ready for that summer vacation you've planned for a whole year. You make a last-minute check. Got the bathing suits? Travelers checks? Suntan oil, guide book, maps, camera, film . . . ? Didn't you forget something? You took a camera, maybe even a movie camera, too, to make a permanent record of fun in the sun. 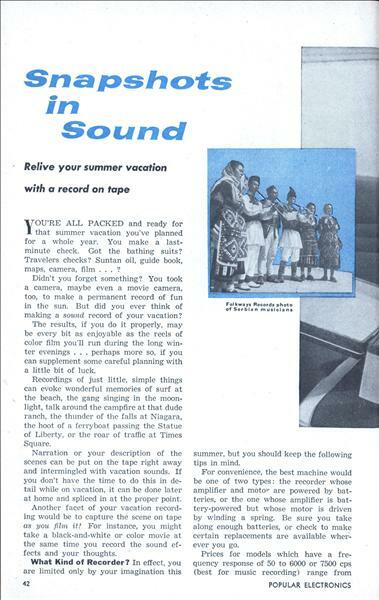 But did you ever think of making a sound record of your vacation? 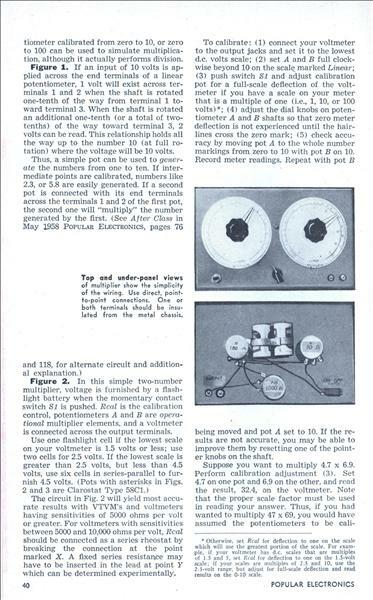 How to MULTIPLY, DIVIDE, ADD and SUBTRACT with simple potentiometer circuits. WHEN we think about arithmetic, we think about addition, subtraction, multiplication and division. Algebra extends the usefulness of arithmetic by employing symbols for quantities. Trigonometry brings into play the relationship between sides and angles of triangles. 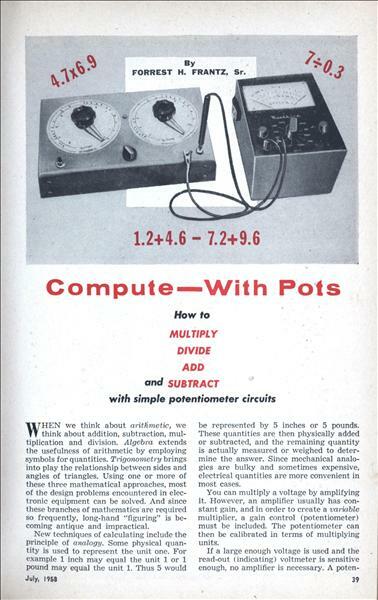 Using one or more of these three mathematical approaches, most of the design problems encountered in electronic equipment can be solved. 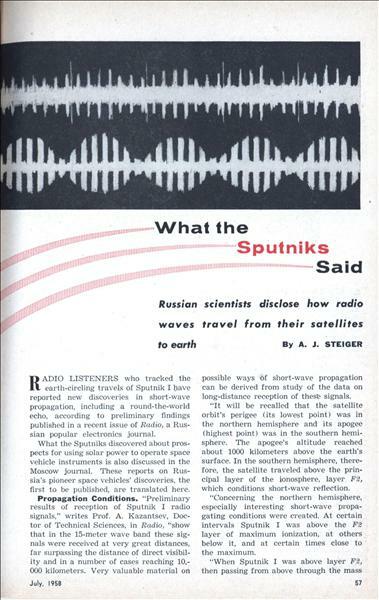 Russian scientists disclose how radio waves travel from their satellites to earth By A. J. Steiger Radio LISTENERS who tracked the earth-circling travels of Sputnik I have reported new discoveries in short-wave propagation, including a round-the-world echo, according to preliminary findings published in a recent issue of Radio, a Russian popular electronics journal. 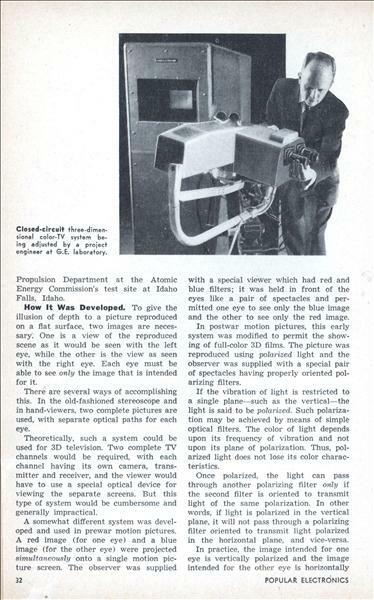 What the Sputniks discovered about prospects for using solar power to operate space vehicle instruments is also discussed in the Moscow journal. 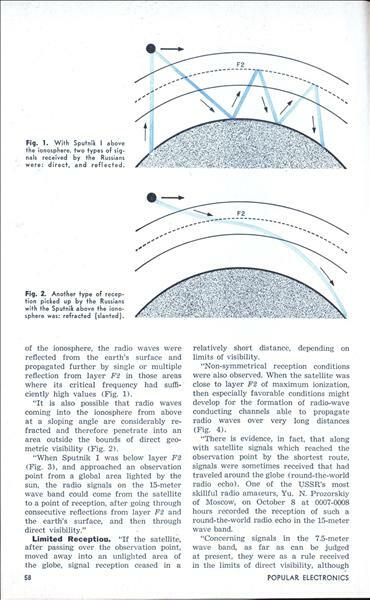 These reports on Russia's pioneer space vehicles' discoveries, the first to be published, are translated here. 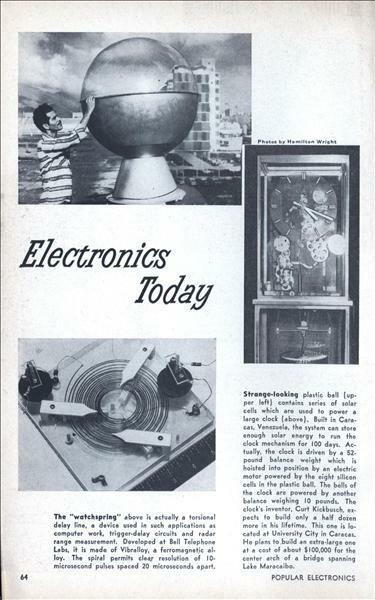 The "watchspring" above is actually a torsional delay line, a device used in such applications as computer work, trigger-delay circuits and radar range measurement. 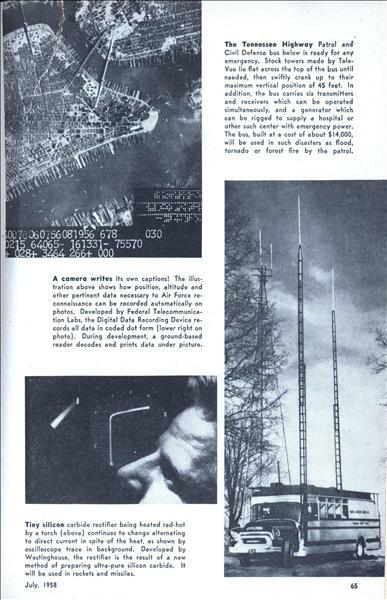 Developed at Bell Telephone Labs, it is made of Vibralloy, a ferromagnetic alloy. The spiral permits clear resolution of 10-microsecond pulses spaced 20 microseconds apart. 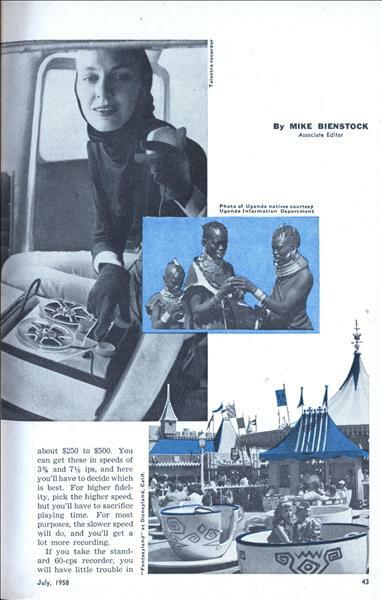 ONE of the most ticklish aspects of the whole video tape operation is the manufacture of the tape itself. 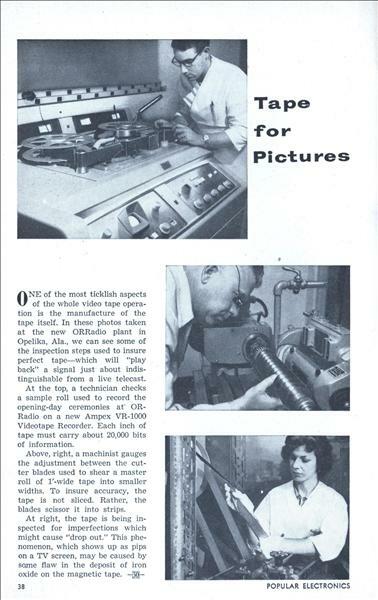 In these photos taken at the new ORRadio plant in Opelika, Ala., we can see some of the inspection steps used to insure perfect tape—which will "play back" a signal just about indistinguishable from a live telecast. 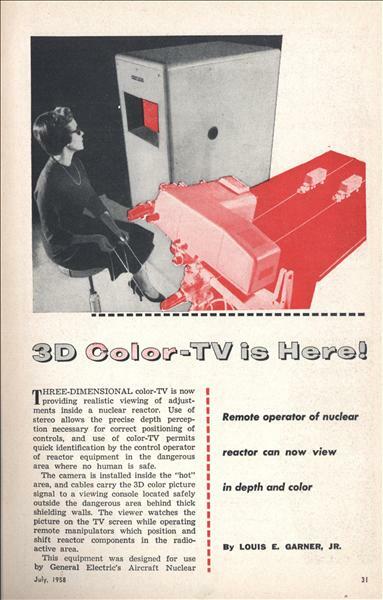 Remote operator of nuclear reactor can now view in depth and color By LOUIS E. GARNER, JR. Three-dimensional coior-TV is now providing realistic viewing of adjustments inside a nuclear reactor. 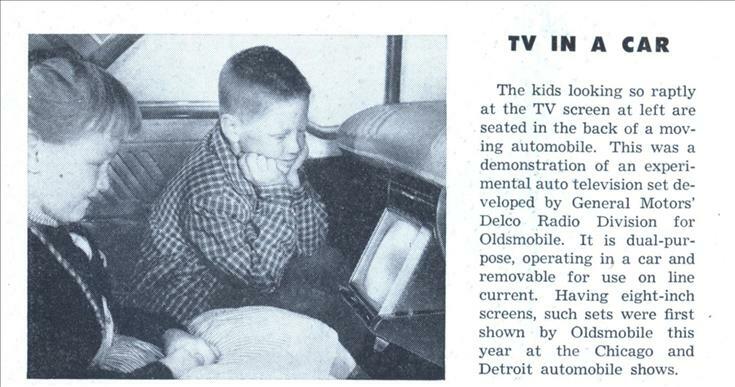 Use of stereo allows the precise depth perception necessary for correct positioning of controls, and use of color-TV permits quick identification by the control operator of reactor equipment in the dangerous area where no human is safe.